This outlet tube is for installing round downspout to half round gutters. The large flange enables easy riveting and sealing. 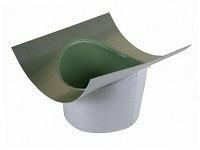 Works with round and round corrugated downspout as well as "B" style rectangular elbows.